Sri Ramana Maharshi stayed at various places in Tiruvannamalai and then in several caves on the Arunachala Hill until he finally settled at what came to be called Sri Ramanasramam where he lived until his Mahanirvana in April 1950. He never took formal sannyasa nor did he claim to have any disciples. From the day he arrived in 1896 until his Mahanirvana, Ramana never left his beloved Arunachala. The first place that Ramana stayed in Tiruvannamalai was the great temple. For a few weeks he remained in the thousand-pillared hall. But he was soon troubled by the urchins who pelted him with stones as he sat silently. He shifted to an underground vault known as Patala Lingam, where the sunlight never penetrated. Without moving he sat deeply absorbed in the Self and was unaware of being bitten up by the ants and vermin living there. But the mischievous boys soon discovered his retreat and indulged in their pastime of throwing stones at the young Brahmana Swami as Ramana was then called. At that time in Tiruvannamalai there lived a renowned Swami called Seshadri Swamigal who sometimes stood guard over Ramana, and drove away the urchins. The youth was so absorbed in the Effulgence of Bliss that he didn’t even realize when some devotees finally came, lifted him out of the pit and brought him to the nearby Subrahmanya shrine. For about two months he stayed in that shrine paying no attention to his bodily needs. To make him eat, food had to be forcefully put into his mouth. Fortunately someone was always there to take care of him. Ramana then moved to various gardens, groves and shrines in the vicinity. It was in a mango orchid away from the temple that his paternal uncle, Nelliyappa Aiyar, from Manamadurai, found him. Nelliyappa Aiyar tried his best to take his nephew along with him to Manamadurai but the young sage would not respond. He did not show any sign of interest in the visitor. So, Nelliyappa Aiyar went back disappointed to Manamadurai. However, he conveyed the news to Alagammal, Ramana’s mother. The Ordainer controls the fate of souls in accordance with their past deeds. Whatever is destined not to happen will not happen, try how hard you may. Whatever is destined to happen will happen, do what you may to stop it. This is certain. The best course, therefore, is to remain silent. With a heavy heart, the mother went back to Manamadurai. Sometime after this event Ramana started to live in different caves on the slopes of Arunachala. The cave where Ramana stayed longest (17 years),Virupaksha Cave, is on the south-east slope. During the early years on the Hill, Ramana was mostly silent. His radiance had already drawn a group of devotees around him. Not only seekers of Truth were drawn to him but also simple people, children, and even animals. Young children from the town would climb up the hill to Virupaksha Cave, sit near him, play around him, and then go back feeling happy. Squirrels and monkeys would come up to him and eat out of his hand. Oh Medicine in the form of a Hill that arose to cure the disease of all the births that come in succession like waves! Oh Lord! It is Thy duty to save my mother who regards Thy feet alone as her refuge, by curing her fever. Alagammal recovered and went back to Manamadurai. In the beginning of 1916 Algammal came back to Tiruvannamalai determined to spend the rest of her life with Ramana. A little later her youngest son, Nagasundaram followed her. Soon after his mother’s arrival, Ramana moved from Virupaksha to Skandasramam, a little higher up the Hill. Here Mother received intense training in spiritual life. She started to cook for the small group of devotees who were staying there. 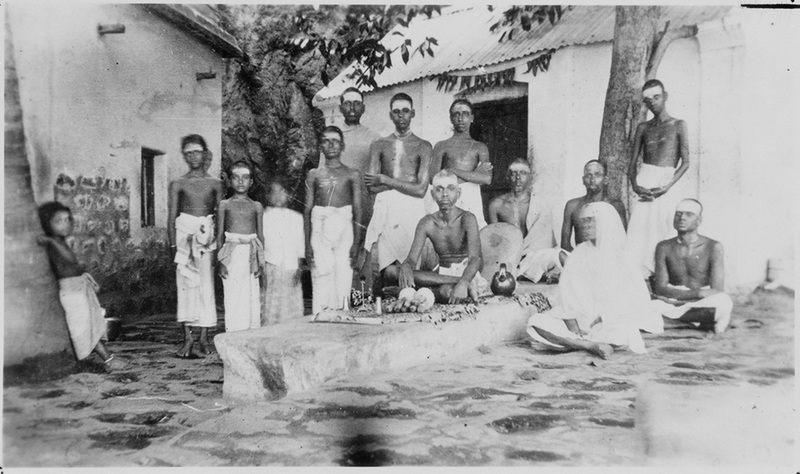 Nagasundaram became a sannyasin, assuming the name Niranjanananda Swami.